In this photo, Robert Tabula is shown leading a training session for the leaders of Katerera Area Co-operative Enterprise (Katerera ACE) a farmers co-op. Katerera is located in far western Uganda, near Congo D.R. Tabula is demonstrating how to write and send an e-mail message. Although some have had experience with internet, by traveling an hour each way by over-crowded taxi to access the nearest internet café; for many in our training sessions, this is the first exposure to e-mail communication. Katerera ACE successfully grows many crops on their fertile volcanic soil, but access to markets has always been a huge challenge. Katerera ACE has been the most successful beneficiary of an I4H ICTC. With Tabula’s aid, they utilize the e-mail and browsing capabilities to find markets and research crop-disease best-practices. Internet for Humanity (I4H) is blessed to have found Robert Tabula. 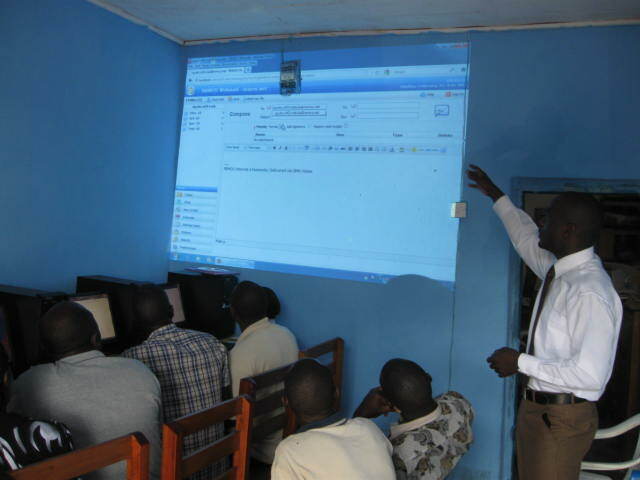 He was the computer teacher at the first Secondary School where we installed an Information/Communications Technology Centre (ICTC) in Uganda. Tabula is a tireless teacher in all aspects of his life. For several years he maintained and supported all the I4H Uganda ICTCs on a purely volunteer basis. He is now our Uganda Country Coordinator. Our goal is to expand the I4H ICTC network in Uganda to the point where Tabula can be employed full-time by I4H. One can not find a more worthy young man. Please help us!